The scores after the title are the individual Top 50 positions / adjusted scores for Europe, the UK and the US, followed by the current Metacritic score. New issue of Mojo magazine unfortunately features Fleet Foxes on the front cover. Sonar 2009 proved to be another monumental year for the electronic music festival. Mary Anne curated the Sonar Lab stage and invited Joker, The Gaslamp Killer and Martyn to take over the sound system. We playback these sets alongside music from Mike Slott, Dorian Concept,Jamie Woon and Hank Shocklee from the Bomb Squad. As a DJ/musician and producer, Ian went under a host of aliases – Ian B, Ian Beta, Eon, Minimal Man, Rio Rhythm Band and most recently, 1integral amongst them ..
-libertarianism and left-libertarianism, rather than "right-wing"
-a roundtable on political economy, Ayn Rand, and Rush's "2112"
2009 album: Pitchfork: A Sunny Day in Glasgow Announce Second Album - On September 15, the band will return with a new album called Ashes Grammar, due via Mis Ojos Discos. new video: Cargo Records Distribution UK: Kode9 & The Spaceape: Time Patrol Video up! 2009 album: The Psyke Project confirm new album | NEWS | ITSATRAP2009 - The dead storm on August 24th. Award-winning producer and DJ Ben Medcalf aka The Rogue Element is back with his highly anticipated follow up to 2005's debut Rogue Rock, an album packed full of surprises and top drawer dance floor stompers. Rob joins forces with dubstep king Rusko for a two hour dubstep special including tunes from Benga, Burial, Skream and Plastician in a 40 track extravaganza . . . can they really do 40 tracks in two hours? Have a browse through...2009 Albums [1600 Albums] - 2009 A - Z Albums Tracking List - a starting guide to new & forthcoming album releases. also: 2009 Expected [720 artists] - Artists that are expected to release new albums in 2009 - awaiting announcements of album titles and release dates. To celebrate the tenth tear of Cocoon Ibiza we've got a triple sized cover and a free Cocoon CD mixed by Sven Vath with every new issue of Mixmag. new book: Galactic Ramble - This is the largest-ever critical overview of the thousands of rock, pop, folk and jazz albums released in the UK between 1963 and 1973. Norbergfestival in Sweden: Norbergfestival - electronic music festival in Norberg Sweden 2009 - Norbergfestival - This year's Norbergfestival will take place on July 30, 31 and August 1. Axel Willner and his new live band will lead the charge with a performance showcasing the new The Field album, whilst dub-hopper Flying Lotus will be joined be fellow countrymen Matthew Dear and Troy Pierce. Radio 1's Mary Anne Hobbs and half of London's Anti Social Entertainment crew (Quest, Silkie, Jay 5, Razor, Harry Craze) will provide some heavy dubstepping action, whilst elsewhere there'll be experimental electronica (Gudrun Gut & AGF), cosmic electro-house (Moon Unit), electro-disco (Aeroplane and tropical minimal house (Wareika) on offer. Central Market, the forthcoming solo album from Tyondai Braxton (Battles) will see it's release on Monday, Sept. 14 (Sept. 15 in the US) via Warp. LIVING COLOUR will release its first new studio album in five years, entitled "The Chair In The Doorway", on September 15 via Megaforce Records. PARADISE LOST have set "Faith Divides Us, Death Unites Us" as the title of their new album, due in September via Century Media Records. new: RA News: Squarepusher gets Electric - Warp Records will release Solo Electric Bass 1 on August 17th, 2009. Brock Van Wey (AKA Bvdub) will release his latest album on the Echospace imprint later this month. Echospace will release White Clouds Drift On And On on June 23rd, 2009. Sweden's KATATONIA has entered the studio to begin recording its eighth album for a late October release via Peaceville Records. This album is highly praised in the new issue of DJ magazine: RA News: Manuel Tur preps 0201 - Freerange Records will release 0201 on June 22nd, 2009. Planet Mu will release Luke Vibert's We Hear You on August 10, 2009. In the new NME, which hits shops on Wednesday 17 June, we celebrate the 30th anniversary of Joy Division's epochal debut 'Unknown Pleasures'. July: The apex of the festival season. From Serbian forts, to German parks; Spanish deserts to the English country side, there could not be a more opportune moment to dive headlong into the action. Come aboard the good ship RA then, as we guide you through the sea that is the month's festivals. more info on upcoming album: RA News: Clark preps Totem Flares - Warp will release Clark's Totems Flare on July 13, 2009. Paper Bag and Permanent Vacation will release Sally Shapiro's My Guilty Pleasure on August 25, 2009.
update via email: re David Sylvian | Manafon - Small Metal Gods | davidsylvian.net :: Expect Everything and Nothing less! via email: [more uptodate than the website] news update The new album from David Sylvian, which is scheduled to be released in September 2009, is called Manafon. A lot of artists involved with the Manafon sessions are from Jon Abbey's Erstwhile label. Known participating musicians are Werner Dafeldecker, Martin Brandlmayr, Christian Fennesz, Keith Rowe, Burkhard Stangl, guitarist/violinist Tetuzi Akiyama, cellist Taku Sugimoto, Otomo Yoshihide and Sachiko Matsubara, John Tilbury, Keith Rowe and Evan Parker. Mutek reviewed: RA: Mutek 2009 in review - Interview - RA looks back at the tenth edition of the Mutek Festival. Warp box set RA News: Warp announces Warp20 - Warp Records will continue its 20th anniversary celebrations with the release in September of Warp20 (Box Set). Belgium based online jazz music retailer: Instantjazz | Online Music Store | Jazz music - Our prime interests include free jazz, improvisation and avant-garde. But I say with total confidence that the decade we've just lived through will be recognised - and not in the far distant future, but very soon - as the worst period for (popular) culture since the 1950s: a decadent, despondent dead zone in which conformity was rebranded - in the media's lickspittle jester prattle - as 'light, upbeat, irreverent'. Ex-members of Joy Division and New Order have formed a new band. Lead singer Bernard Sumner, drummer Stephen Morris and New Order guitarist Phil Cunningham have joined forces with Blur's Alex James for a new project called Bad Lieutenant. 2009 album: RA News: Felix Da Housecat preps He Was King - Nettwerk will release Felix Da Housecat's He Was King on August 25, 2009. 2009 album: RA News: Joakim journeys to Milky Ways - K7 will release Joakim's Milky Ways on September 15, 2009. 2009 album: RA News: Lusine needs a certain distance - Ghostly International will release Lusine's A Certain Distance in September. A mix of the groovy krautrock of Neu! and New York 1980’s no wave/disco created by bands such as Sonic Youth, DNA, and ESG, infused with elements of the instrumental Black Flag of The Process Of Weeding Out & the avant/post-punk of This Heat. PRE-ORDER NOW FOR RELEASE 15 June 09 - Amazing new album of krautrock-inspired beauty! - Subway II, the debut album by Subway on Soul Jazz Records, is a startling cosmic marriage of influences – German electronic rock music from the 1970s (Cluster, Kraftwerk, Neu, Harmonia, Ash Ra Tempel), 80s Detroit science fiction techno (Carl Craig, Juan Atkins, Jeff Mills) and a hint of Italian and European disco (Danielle Baldelli meets Cerrone, Space, Moroder and Jean Michel Jarre). --- Subway are Michael Kirkman and Alan James and have been releasing music since 2000. Subway II was recorded at home in East London using a plethora of analog equipment and techniques that enabled them to create sound reflecting cityscapes such as Berlin, Dussseldorf, Detroit and Paris whilst at the same time creating a contemporary musical commentary of London in 2009. We are entering Fascination Street studios in Örebro, Sweden on June 15 to record our fifth album, which will be called 'New Moon'. The album will be produced and mixed by Jens Bogren, who has worked with such names as KATATONIA, OPETH, PARADISE LOST and AMON AMARTH, just to name a few. And as we announced earlier, Kai Hahto (WINTERSUN, ex-ROTTEN SOUND) will be playing drums on the album. label spotlight: mnml ssgs: italians do it better? interview: RA: Steve Bug is Collaboratory - Interview - Go in-depth with the Poker Flat label head as he walks you through his newest album. 2009 album: Gothtronic | News: CLAN OF XYMOX Put Their Trust in Love - Released on Metropolis and Trisol and available August 18th, 2009. Former NEGURA BUNGET members Hupogrammos (guitars, vocals, bass, keyboards, archaic instruments) and Sol Faur (guitar) have launched a brand new project called DORDEDUH (rough translation: "yearning for the spirit"). The band's lineup also includes Arioch (former bassist for NEGURA BUNGET and ex-guitarist of ODEM ARCARUM and SECRETS OF THE MOON), Thelemnar (SECRETS OF THE MOON, THE VISION BLEAK, NEGURA BUNGET) and Sergio Ponti (EPHEL DUATH, ILLOGICIST). date of release - 24-07-2009. Costa Rica-based melodic extreme metal band SIGHT OF EMPTINESS has posted two new songs — "Predictable Tragedy" and "Burning Silence" — on the group's web site. Both tracks comes off SIGHT OF EMPTINESS' second album, "Absolution of Humanity", which is expected to be released later in the year via an as-yet-undetermined record label. The CD was mastered by Jens Bogren (OPETH, AMON AMARTH, SOILWORK, BLOODBATH, KATATONIA, SYMPHONY X) at Örebro, Sweden's Fascination Street Studios. 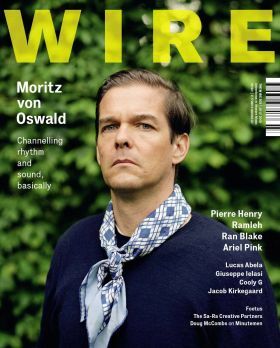 New issue of The Wire features Moritz von Oswald on the front cover. Yesterday, Hugh Hopper, British progressive rock and jazz fusion bassist and composer (Soft Machine) died at age 64. He was a prominent member of the Canterbury scene, as a member of Soft Machine and various other related bands. Not sure where to go now that DC-10 is officially closed for the summer? We've got you covered. RA's Grego O'Halloran provides your essential guide to the 2009 party calendar in Ibiza. Black Anvil formed in 2007 and are currently writing for their second full-length album. Relapse will first issue the band's debut LP, Time Insults The Mind, this fall as they continue writing. On September 3rd Cirrha Niva will release their new album For Moments Never Done. The album will be released through the band’s own independent record label Parnassus Records. French black metallers REVERENCE have completed work on their third album, "Inactive Theocracy", due in September/October on CD and vinyl via Osmose Productions. The effort was recorded and mixed at Drudenhaus Studios with Neb Xort (ANOREXIA NERVOSA) and was mastered at MasterLab studios in France. Radiohead singer Thom Yorke is to play a rare solo concert, appearing at the Latitude Festival in July. Have a browse through...2009 Albums [1500 Albums] - 2009 A - Z Albums Tracking List - a starting guide to new & forthcoming album releases. also: 2009 Expected [731 artists] - Artists that are expected to release new albums in 2009 - awaiting announcements of album titles and release dates. Tummaa will be released on August 24 on CD, digital and limited edition 2xLP by The Leaf Label, home to the likes of Murcof and Wildbirds & Peacedrums. RA chats to the legendary DJ in advance of his New York date this weekend about site-specific music, taking his record label digital and Richie Hawtin. Israel's ORPHANED LAND is continuing work on its highly anticipated new album, "ORwarriOR", due later in teh year via Century Media Records. June 26th is "Crop", the new album from the legendary British electronic and industrial band Portion Control. UK music magazine The Wire are once again a media partner. new web tool: Album Reminder - new music album releases - notifications via email & rss - Album Reminder notifies you via Email or RSS when your favorite artists or bands release new albums. 2009 album: Frankmusik Announces Album Details - FrankMusik news on Clickmusic - Complete Me on 27th July. Titled God Is Good, OM's new album is set to be released Sept. 8 on new label Drag City, and was recorded with Steve Albini in Seattle. ULVER performed for the first time in 15 years yesterday (Saturday, May 30) at the Norwegian Festival of Literature at Maihaugsalen in Lillehammer, Norway. Sound and Music is the UK’s landmark organisation for new music and sound, bringing a vital art-form to more people. Over the past few weeks I’ve been playing catch-up with a number of 2009 releases (mostly ambient, I should add). June music festivals: RA: Top 10 June 2009 Festivals - Interview - RA picks the June festival highlights from across the globe. confirmation of UK album release date: Teletext Planet Sound News: A-ha's mountain to climb - A-ha return on July 13 with new album Foot Of The Mountain. Instrumental act Dysrhythmia have posted the song “Festival of Popular Delusions” at their MySpace page. The song comes from their upcoming album, “Psychic Maps”, due out via Relapse Records on July 7th in North America and July 13th internationally. new video: via twentyfourhours 24:hours are big fans of The Emperor Machine and this video, for the new single Kananana, is simply awesome. As a seductive taster and spectral glimpse of the forthcoming King Midas Sound full length, ‘Dub Heavy - Hearts And Ghosts’ is an EP of three of that album’s tracks dubbed into new alien versions. King Midas Sound is the duo of Kevin Martin, known for his groundbreaking work over the last decade as The Bug, teamed with Roger Robinson, reputed writer and spoken word performer.